French manicure is a great classic look but with a bit of creativity, it can be transformed entirely. French tip nails have so much potential for experimentation simply by combining unusual colours. Like I said here, if you’re struggling with nail art inspiration, take a classic look and add a new twist to it. In this instance, I combined mint, emerald and silver and instead of a simple French tip, I added a silver line to the emerald detail. Et voilà! An unique new design with a bit of sparkle. Now here’s the #ThrowbackThursday story behind this manicure. The freehand Double French tip was one of the nail art techniques that I demonstrated at Nail Stars Sydney during the masterclass As you have probably guessed, the look was entirely hand painted, no stencils. If want to try this look but didn’t get a chance to attend the masterclass, don’t despair, you can always use these stencils for a flawless French manicure. This French Manicure tutorial can also be helpful. Used: Essie No Place Like Chrome, Sea Siren Motion of the Ocean and Jealousea + Essie Good To Go top coat. I used this nail art brush to do the French tip details but if you’re after an easier solution, use these French manicure stencils. Wearing: T-Bar ring and Secret ring. So what do you think about this Double French tip manicure? Do you have a go-to design that you like experimenting with? As always, if you create nail art inspired by this tutorial I’d love to see and share it! Tweet or Instagram us a photo with the tag #sonailicious. P.S. 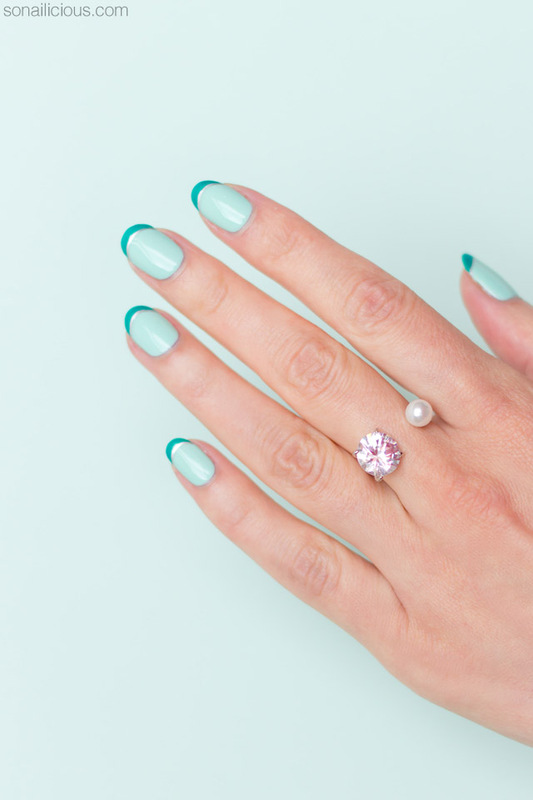 Want to see more unusual French manicure ideas? Check this, this and this out.